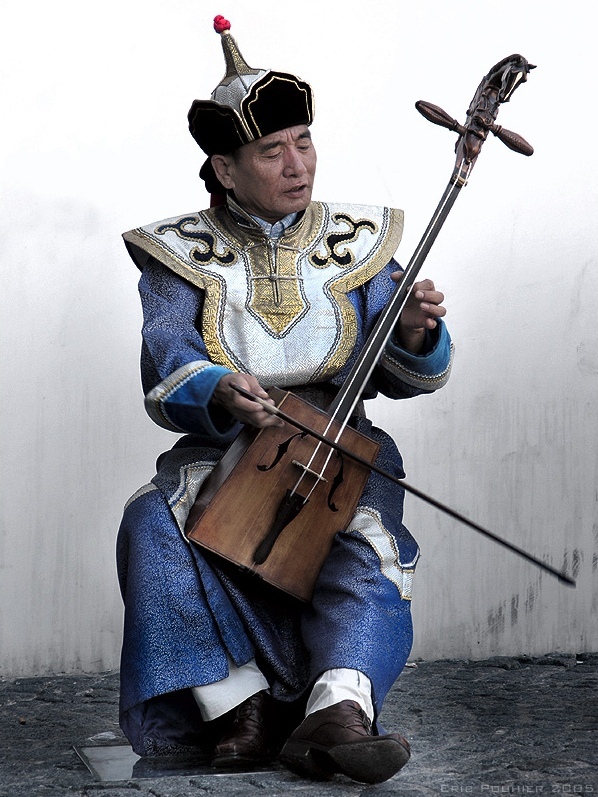 Sambuugiin Pürevjav of Altai Khairkhan playing a morin khuur near Centre Georges Pompidou in 2005. The first recorded reference to the bowed lyra was in the 9th century by the Persian geographer Ibn Khurradadhbih (d. 911); in his lexicographical discussion of instruments he cited the lyra (lūrā) as the typical instrument of the Byzantines along with the urghun (organ), shilyani (probably a type of harp or lyre) and the salandj (probably a bagpipe). The lyra spread widely via the Byzantine trade routes that linked the three continents; in the 11th and 12th centuries European writers use the terms fiddle and lira interchangeably when referring to bowed instruments. In the meantime, the rabāb, the bowed string instrument of the Arabic world, was introduced to Western Europe possibly through the Iberian Peninsula and both instruments spread widely throughout Europe giving birth to various European bowed instruments such as the medieval rebec, the Scandinavian and Icelandic talharpa, and the Celticcrwth. A notable example is the Italian lira da braccio, a 15th-century bowedstring instrument which is considered by many as the predecessor of the contemporary violin. The erhu can be traced back to instruments introduced into China more than a thousand years ago. It is believed to have evolved from the xiqin (奚琴), which was described as a foreign, two-stringed lute in Yue Shu (樂書, yuèshū, lit. book of music), an encyclopedic work on music written by music theorist Chen Yang in the Northern Song Dynasty. The xiqin is believed to have originated from the Xi people of Central Asia, and have come to China in the 10th century. Bowed strings seemed to have originated as a whole in the Middle East and/or Central Asia–regions of the world that share a lot of overlapping cultural ties–and then spread West and East into Europe and Asia.